Plarium Global Ltd., the creators of Saga Of Survival game has just released a brand new turn-based RPG Invictus Heroes. In this game, the player builds a squad of heroes to defeat the monsters in a wide range of game modes; Arean(PvP, Tournament, Duel), adventure mode(missions), and more. The game features a simple beginner friendly battle system in which you will strategically play the turns to trap enemies and steal the victory. We have put all the information on Invictus Heroes game in today’s Invictus Heroes guide and Invictus Heroes tips, cheats & strategies. If you have any question, then ask in the comment section below. Let’s get started! 1.) 4-Stars – At each stage in the adventure mode, you can earn four stars. The player becomes eligible to use the raid feature as soon four stars are obtained. To earn four stars, you will have to repeat a stage several times. When the player finishes a stage, the game rewards mission points. After gaining a certain number of mission points, you will earn a star. Go to the mission screen -> tap a stage -> just below the stars, you can check the number of mission points required to earn one more star. Accumulate these stars to unlock the raid feature. Raid feature lets you complete a stage instantly. 2.) Magic Items – In the battle, you can use magic items to gain an advantage. For example; restore health, debuff items, restore mana, buffs, increase in armor/attack power, and more. Go to the squad -> tap on any hero -> inventory -> tap the + button -> at the bottom menu, head to the magic tab. There you can purchase these magic items. Use these items in the battle at the right time. 3.) The Battle Basics – In the battle, there are three ways to attack the enemies; normal attack, spells, and magic items. To cast spells or use some magic items, you need mana. Mana regenerates over time. After casting the spell, you can perfrom basic attack by tapping the enemy. You can add up to five heroes for the battle. Three heroes in the front and two heroes in the second lane. Crusade Mode – Crusade is one of the challenging game modes in Invictus Heroes game. The reason is in this mode, the stats of characters carried over to the next battles. For example; In the first stage battle, a character’s HP gets reduced to 50% due to enemy attacks. In the next stage, that character will start from the 50% HP rather than 100%. Boss Mode – The name says it all. In this mode, you will fight against the powerful boss who uses magical spells to vanish your squad in a few turns. Defeating the boss in this mode grants loads of items; gold, crystals. Guild Crusade – In this mode, all the guild members deal damage to the boss. Depending on the damage dealt by the player, the game will reward ducats. Ducat is the name of guild currency. You can use it contribute to Cornucopia for bonus rewards or buy items in the guild shop. So this is the Invictus Heroes basics. Let’s learn how to power up the heroes and dominate in the arena ranking, duels, and boss battles. We have divided this part into these sub-sections; obtaining the heroes, improving the heroes, hero classes, squad formation. How To Get Heroes In Invictus Heroes? Go to the squad menu -> on the left side of the screen, tap on any locked hero -> at the bottom-right corner, there would be an option – “Where To Find”. Tap this message to check the stages. How To Improve Heroes Or Power Up Heroes? Increase The Hero Level – There are multiple ways to level up a hero; the first free method is by playing the mission mode stages. When you get the victory in these stages, heroes in the squad will get a huge amount of EXP. The second method is by using the potions. These potions are dropped from the chests. When you defeat the enemies in the battle, they will turn into the chests. The three types of potions are; small elixir, middle elixir, large elixir. To use these potions, go to the squad -> tap the hero -> at the top-left corner, tap the + icon. Or tap the menu button -> trophies -> tap the potion option -> use. Insert Amulet – You can earn amulets from the mission mode. Amulets come in ranks; rank 1, rank 2, rank 3, and more. For example; the hero’s rank is 2. So you can equip rank 2 amulets only. Go to the squad menu -> amulets -> tap the slot -> equip. If you have no amulet, then it will show you the stages where you can earn it. Increase The Hero Rank – When you equip all the amulets, an assemble button will appear. Assembling the amulets will consume all the amulets and increase the hero rank. Rank up the hero to increase its star level. You can check its star level at the top-left corner in its profile menu. Upgrade Spell – As you know, spells are also important. You can upgrade these spells using the spell points. Spell points regenerate over time. Go to the squad -> hero -> spell -> tap the + icon. Inventory – This is where you can spend gold and buy loads of items for the hero; attack items(to increase damage), armor(to increase defense), health items(to increase HP), mana items(to restore mana), magic items(read the basic part above for more info), special items. Since inventory slots are limited, you will have to spend diamonds to buy more. Improve Items – You can use gems to improve items, purchased from the inventory. You can manufacture gems in the workshop. Go to the citadel -> workshop -> choose gem -> order a gem. To improve an item, go to the inventory menu -> tap the item(attack/armor) -> improve. Use Souls – In the first part of hero guide, we have already mentioned that souls are needed to summon heroes as well as in increasing the hero’s stats; Health, mana, damage, armor, accuracy, and initiative. You can get souls in the missions. Head to the soul tab in the hero’s profile page -> tap the + icon next to a stat. Guardian – Guardian type characters have good HP stats and defense stats. They can absorb massive damage. Mage – Mage-type characters can heal the allies, apply debuffs on the enemies, buff on the allies. Place the guardian type heroes in the first lane. In the back row, place assassin or mage type characters. The guardian character will take damage and protect the back row allies from damage. In short, put the heroes with high HP stats in the first row and best attackers/mage in the second row. 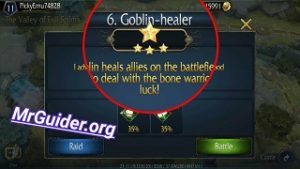 Items Farming Guide – How To Get Everything Free? So this is a short Invictus Heroes guide for the beginners. Let’s take a look at our top Invictus Heroes tips, cheats & strategies. At the start of the guide, we mentioned that at each stage, one can obtain 4-stars. But to get the 4-stars, you will need to play that stage several times. Additionally, when you get 2/3/4 stars, you will also earn crystals/diamonds. After obtaining the 4-stars, you can use the raid feature. Tap the stage -> raid -> use raid tickets. You can get raid tickets by completing the mini-quests. So we would recommend you to play each stage until you get 4-stars. Invictus Heroes game features loads of mage class characters; Vorak, Gran Ten, and more. Some of these characters can heal the allies in the battle(restore the hero’s health). For example; Vorak can heal all the allies in the battle. We would recommend you to include at least one mage character having the healing ability. Go to the squad -> tap on any hero -> on the bottom-left side, you can check the hero’s attack type; healing, fire, weapon, and more. This is what you have to do as you progress in Invictus Heroes. You have to power up the heroes by increasing their level, rank, inventory items, soul stats, spell power, and more. A brief detail of each effect is mentioned above in hero guide part. Magic Items helps a lot in difficult stages. For example; some magic items can instantly heal the ally, apply debuffs(reduce the enemy’s damage, armor stats), recovers mana, apply buffs(increase the attack/armor power). We would recommend you to equip these items if you are stuck on a particular stage. Read the magic items guide above. You can earn EXP, crystals, diamonds, gold by completing the tasks, quests. Tap the menu -> tasks/quests. Additionally, for transfer tickets, raid tickets, complete the mini-quests. Transfer Ticket? You can use this transfer ticket to transfer an item from one hero to another. Go to the squad -> hero -> inventory -> tap on the item(owned) -> tap the switch(reload type) icon -> transfer. You can earn souls, shards, diamond, elixir, and much more from the chests. Go to the home screen(Castle) -> there would be a chest -> tap it -> you can spend gold or crystal to get these chests. If the squad power is way too high than the enemy’s squad, then you can use this feature to complete the mission instantly. In the battle, at the bottom-right corner, tap the gear icon -> quit the battle. So these are the top Invictus Heroes tips. You can also share your Invictus Heroes tips in the comment section below.